Rise of the Blade is a fantasy novel written by Charles Moffat in 1998 for the Harpers Series of Forgotten Realms. It was originally intended to be the middle book of a trilogy of 3 books. The first book tells the story of Pierce O'Hiram and Marque Draque and their various adventures, including fighting the Tarrasque and Pierce becoming a slave gladiator in the jungles of Chult. The second book you see here, and the third book would tell the story of the drow bard Valeska Ko'Ragur. The first book would have been a prequel and the third book a sequel, thus completing the trilogy. However all of this became moot when TSR, the owners of Forgotten Realms, was bought by rival company Wizards of the Coast. The Harpers Series was scrapped and the book "Rise of the Blade" was never published in paperback. However times have changed since 1998. 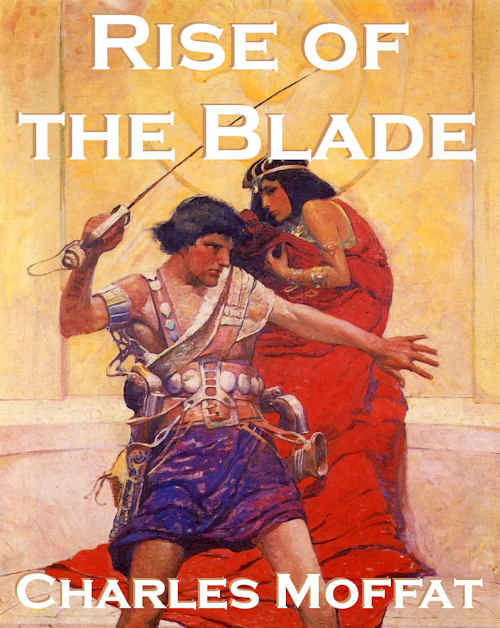 "Rise of the Blade" rises again, but this time as a Free eBook. Wizards of the Coast contacted Charles Moffat in 2011, but there has been no agreement with respect to the publishing of "Rise of the Blade" and thus it remains in publishing limbo. The cover art was painted in 1917 by American illustrator Frank Schoonover (1877 - 1972). Schoonover painted art for fantasy / pulp classics of the early 20th century. Read Chapters Four to Thirteen + the Epilogue by downloading the Free eBook!